Preheat oven to 350 degrees F (175 degrees C). Lightly grease 6 large custard cups. Whisk together the egg and egg yolks in a large bowl. Add the milk, sugar, pumpkin puree, vanilla extract, salt, cinnamon, nutmeg, and cloves; whisk into a smooth batter. Add the bread cubes and toss gently to dampen. Set aside for 15 minutes. Pour the batter evenly into the prepared cups. Sprinkle chocolate chips and brown sugar over each portion. Arrange the custard cups in a shallow baking pan. Pour hot water into the baking pan to halfway up the sides of the custard cups. Bake in preheated oven until pudding is golden brown and puffy, about 40 minutes; transfer to cooling rack for 10 minutes. 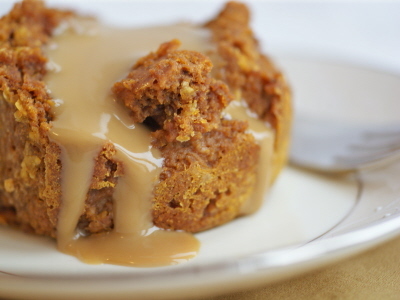 No comments for: "Pumpkin Bread Puddin' Recipe"